The community consists of posts associated with different discussion topics. Topics can be anything you want, and you can create as many as you want. Guide managers can add, edit, delete, and manually arrange topics. Agents don't have the permissions to make these changes. The community is available on Guide Professional and Enterprise. For information about managing community posts within discussion topics, see Managing community posts. Discussion topics can be anything you want. You can add as many topics as you need. For example, if you support multiple products, you might add a topic for each product. If you have one product with a lot of functionality, you might add a topic for each major feature area or task. If you have different types of users -- end-users and API developers, for example -- you might add a topic for each type of user. You can also add a General Discussion topic where users can discuss issues that don't quite fit in the other topics. Click Add in the top menu bar, then select Community topic. Enter a Name and optional Description for your section. Select a User segment to determine who can access this topic. By default, a topic is visible to all users. You can chose to restrict access to signed-in users. On Guide Professional, you have the option to restrict access to agents and managers to create internal-only access. On Guide Professional, you can also apply custom user segments you've created to further restrict access based on tags, organizations, or groups (see Creating user segments to restrict access). Under Who can manage articles, select Managers if want only Guide Managers to add and edit articles, or leave Agents and managers selected if you want agents to also be able to add and edit articles in this section. You can edit a discussion topic if you need to change the name, description, or access privileges. You can delete a topic if you no longer need it. When you delete a topic, all the posts in the topic are also deleted. If you don't want to delete the posts in the topic, you should move the posts before you delete the topic. Open the topic in Help Center, then click Edit topic in the top menu bar. Make your changes to the name or description and click Update. Be sure you've moved any posts that you want to save to another topic. Click the Delete topic link on the page. You can manually reorder your community discussion topics. You cannot reorder the posts within a topic. In Guide, click the Arrange content ( ) icon in the sidebar, then click Arrange topics. Click any community topic, then drag it to another place in the order. I would love an option so I can make agents and managers the only ones who can write in a specific topic. Like your Announcements or have I missed any settings / feature for this? If you check out the section above entitled Restricting access to community content, you'll see how you can set up those restrictions. Yeah, I would like to have a topic that anyone can view, but only the agents and managers can create posts in that topic. Is this possible? We want to use that topic for news and release notes etc. Of course I can use a section for this in the help center, but would like to have this in the community instead. Hey Tobias, thanks for clarifying! That's a bit of a head-scratcher. There's no setting that will allow you to restrict your Community content in that way. You could theoretically modify your HTML to remove the "new post" button from the topic page, but unfortunately that would apply to every topic page, and sort defeat the purpose of a Community. It might be possible to hide the New Post button on just one page using some JS magic, but that's outside my purview here in support. Perhaps another member of the Community can shed some light on that for you. Otherwise, your options would be to have your Announcements section in the Knowledge Base portion of your Help Center (like ours), or put the Announcements in the Community and just monitor it carefully so you can move any unrelated posts to a different topic. is there a way to close "topics" on a forum as you can close "comments" on a topic? Can you allow anyone to view community posts but restrict commenting to logged in users? Hey how can I close some post for further comments? @Shruti - If you are a Help Center Manager, you can click the gear icon above the regular post and select Close for comments from the drop-down menu. @Jen and @Chris - Apologies for the delayed response. @Jen, when you say "topics", are you referring to the posts that users add in your community, which can then be commented on? 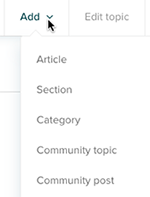 For our purposes, "Topics" are the sections you create in your community, "Posts" are what users create within those topics, and then other users can comment on those posts. There isn't a way to close topics to prevent additional posts from being created. You could potentially customize the code for your Help Center to hide the "New Post" button, so users won't have the option available to them...I'm not sure if that would remove the "New Post" button from ALL topic pages or not, though. One of our Help Center gurus would have to weigh in on that. @Chris, the Help Center is automatically set up to require login before being able to post or comment. New users will have the option to sign up so they can post and comment, but it's not possible to post or comment anonymously. As long as you don't set up any restrictions anyone can view the content without logging in. Please let me know if any of you have any other questions! Any plans to be able to merge posts? While the relevant topics feature is useful, this wont fully stop duplicate posts. To make sure community content stays clean and tidy, merging similar posts would be a nice touch here! I agree with you! :) Our team in Copenhagen is working hard on making our Community features better, but I'm not 100% sure what all is on their to-do list at this point. I'll do some checking around and see what I can find out. Is it possible to translate the community topics? How can I access the topics list page? (Not the page to manage the list, but a page with the list as a customer might see it.) Our forums were set up before I was given the job of managing it, and our only "index" is an article that lists and links the topics. I just created a new topic, so obviously it's not in that article, and I need to get the URL. Thanks! Hi Team, apologies if I am posting this in the wrong place. But I am looking for a way to manage an unruly beast of Feature Requests posted by our Customer base. Sadly this particular section of our forum has been left unattended, resulting in months/years worth of posts either without a recent response, or worse yet; no response at all. But is my only option to go page by page, post by post, and base my priorities manually? i.e. top priority would be the last page of posts with 0 comments? Or is there a fantastical App out there that will sort and group these posts into priorities for me. If anyone has any wonderful hints/apps to help manage an unattended section within the Help Center, much appreciated. I'm trying to figure out how to translate the topic name. Is there any info on that ? Hi Virgile! Welcome to the Community! Localization of content in the Community doesn't work the same way it does in the Knowledge Base...can you tell me more about exactly what you're trying to do? That will help me figure out the best solution for you! Welcome to the Community, Rahimi! I'm sorry it took so long for us to respond to your question. Where are you trying to publish a new topic? Are you working in your own Guide, or are you trying to do something here in the Zendesk Community? Heya :) I see that you can customize the 'New Community Post' page within the Theme Editor - is it possible to add custom fields in the Community Posts? We would like to add another specific field (possibly text entry or dropdown) in addition to the Title, Description, and Topic options....is that possible? If so, how would I do that? Thx for any guidance you can offer! Is it possible to create sub-topics at all? Or any other form of layers to filter down to? Different types of communities for example? We have multiple products and would ideally like quite a few topics per product, so having all of these from the main community page would be quite overwhelming. Hi Sam! Welcome to the Community! I'm afraid that the Community only has the two levels: Topics and Posts. We face a similar problem on our end of things; what we've started doing to combat it is using naming conventions to ensure that it's clear in the Topic title which product it's for, and then arranging them so that like topics are all grouped together. Is it possible to customize the order in which the Topics display, or is it only alphabetical? Do you know how to easily change the colours or add any images to the topics? You can move topics around in any order you wish. Go in to your Guide admin, and on the left-hand side click the third icon down, it looks like three boxes stacked up. This should say "arrange content" if you hover over it. Then, click "arrange topics" and from there you can just drag and drop. Just remember to save; the button is somewhat un-intuitively in the upper right-hand corner, and doesn't give you much feedback when you click it. As far as colors and images, that will require code customization. Some of our community moderators are experts with this sort of thing; I'll see if one of them can pop in and make some suggestions for you. Thanks for that, very useful to know! That would be great - can you link me to any documentation/guides for this customisation? Here's a Community tip on adding images to categories in Help Center; I suspect it's a similar process to add images to community topics. Here's a list of all community tips for Guide. You could also create a new post in the Q&A topic in the Community asking for help with the custom code for this; I suspect one of our members can help you out. If you wish to have Zendesk put those customizations together for you, you'll want to reach out to our Professional Services team. Hello. Is there a way to hide the image uploader in community posts? We'd prefer our users not upload images. In your style.css file in the Guide editor, try adding this to the end. It will hide the button for the image upload, like this. That's perfect. But that also impacts moderators too. So, it's none or all? Assuming they're actual Zendesk agents you could try something like this. This should* hide the button for users that are in the end-user or anonymous user set, while leaving alone for agents/managers. You'd likely need to remove the CSS you added from my previous post for this to apply correctly. *This is a bit beyond the scope of what I can easily test with my current environment. That code may work, or it may not, but it should get you close to what you're trying to accomplish. Sorry I can't be more precise at the moment. Thanks, Dan. This did not work, but it does get me closer. Something to play with. Appreciate your efforts! Would appreciate any urgent advice. Is it possible to use HTML within Zendesk community? For example, if we want to embed an image and have it displayed centered?